Is the Possibility of a Unified Korea Lost? Two decades ago, Harold Koh thought he would soon see North and South Korea reunited. Today, the Yale professor who served in both the Clinton and Obama administrations says he no longer expects it will happen in his lifetime, if ever. 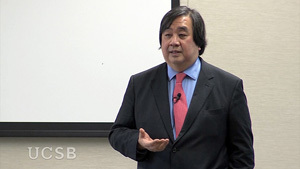 Koh explained why he believes a series of missteps by Presidents George W. Bush and Donald Trump have stopped progress toward a unified peninsula during a recent talk at UC Santa Barbara. Koh has dealt with the challenges of North and South Korea since before he was born. His mother was trapped in North Korea when the country was divided after WWII. She and her family hiked for days to the border, and were able to make it back to Seoul. His father worked in politics, but was forced to seek asylum in the United States after the South Korean government was overthrown in 1961. Koh eventually followed in his father’s footsteps, becoming a legal scholar and diplomat. Koh was optimistic about a peaceful resolution between North and South Korea back in 2000. He had just left Pyongyang after what was the highest-level diplomatic visit up to that point. He says there were plans in motion to move the 2002 World Cup to North Korea with a unified Korean team. But, when George W. Bush took office and named North Korea as part of the “axis of evil,” Koh says those plans, and any hope of uniting the countries, died.